If you are in the Birmingham, AL area and looking for some hardwood floor cleaning tips than you are in luck! That’s exactly what our professionals at Heaven’s Best Carpet Cleaning have put together for you! We are a full service carpet, tile and grout, hardwoods, and upholstery cleaning service and we want to provide our customers with unmatched customer service, cleaning service, and follow-up maintenance tips for the longevity of all your flooring needs. To begin, we want to share with you tips from the Hardwood flooring manufacturers of prefinished wood floors. 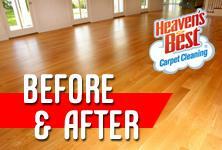 They have specific recommended cleaning products for maintaining the wood floor's finish. It is best to use their recommended cleaning products and follow their instructions so you do not void your warranties. If you don't know the manufacturer of your wood floors check with your local flooring retailer since there are many different wood floor finishes today. Always test the cleaner first in some obscure corner, such as closet or pantry to make sure you are using the right product. Don’t use ammonia cleaners or oil soaps on a wood floor — they’ll dull the finish and affect your ability to recoat later. Do use a professional hardwood floor cleaner to remove occasional scuffs and heel marks (just spray some cleaner on a cloth and rub the stained area lightly). Professional flooring retailers carry specially designed spray cleaners designed for today's hardwood flooring. 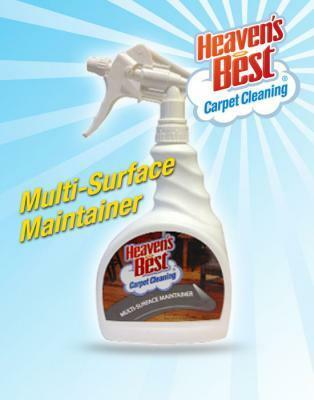 Heaven’s Best Carpet Cleaning has their own professional spray available to their consumers and at a discounted price after a hardwood floor cleaning service. Don’t wet mop or use excessive water to clean your floor (wood naturally expands when it’s wet and can cause your floor to crack or splinter). We hope these tips are helpful for your hardwood floor cleaning needs for all of your professional needs and once your surfaces need a thorough cleaning, give the Heaven’s Best Carpet Cleaning in Birmingham, AL a call at 205-618-9150 to get those floors looking like new again!